Description: this dinosaur, a slender bipedal carnivore with a very characteristic head, sports two semi-circular ridges on top of its head, with a little spike behind each. Also, the large frill (not removable), which was a made up feature for the Dilophosaurus in the first Jurassic Park movie, makes it easily recognizable. The figure stands in a sort of stalking mode, with its body and tail bent, its legs and arms wide apart, its head posed to the left and its jaws opened. The figure has a large dino damage wound on its left flank, showing white bones and red muscle tissue, with a button inside it, which produces a hissing shriek when pushed. Also, an orange lever is located on its back: when pulled, the figure slashes its arms back and forth and makes a hissing, rattling attack roar. This Dilophosaurus has a very fiery paint job. Its underside (lower jaw, throat, belly, underside of the upper arms, inner part of the legs and lower part of the tail) is coloured simply beige though. The rest of the body is covered in a reddish brown paint job. 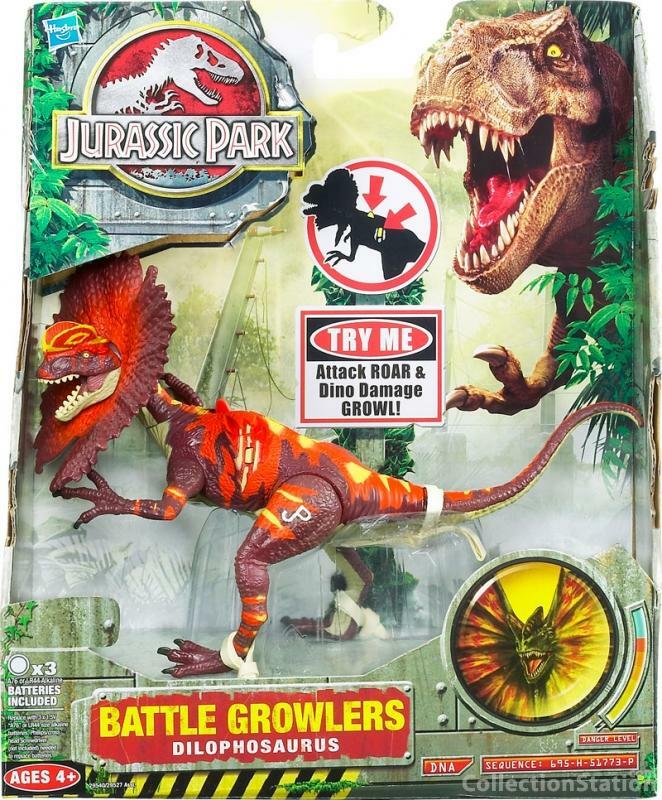 Its neck, back and tail are adorned with orange colouring which largely extends over the flanks (including the dino damage wound) and has various small rounded and spiky shapes running out of it, most notably on the hips and tail. Additional orange stripes and shapes are found on the limbs. In most cases, the orange colouring is accompanied by small yellow spots and shapes found in the middle of it. The top of the head and the crest are coloured red, with red stripes running over the face over the snout and ocular area. The crests are equipped with thin yellow lines running around its edges, and also forming a circular shape in the middle of each crest. Unlike the rest of the figure's bright colouring the crests are adorned in a symmetrical pattern instead of randomly. The big frill around the creature's neck is painted plain reddish brown, like most of the body, except for the centre of its front side, which is coloured orange and gradually shifts into aforementioned brown. The figure has a pink tongue and inside of the mouth, white teeth, small green eyes (with white pupils and black irises), black claws on both toes and fingers and a white JP logo on each upper leg. Analysis: finally, the return of the Dilophosaurus sculpt! Too bad they didn't retool it like they did with the big T-Rex, since all of this figure's former faults remain intact. To start with, its frill still can't be removed, hindering not only overall playability and rendering its front side too heavy so it can't stand up straight, but also being in the way of the attack action of the arms, which has a very limited range because of this, and is otherwise rather unimpressive. Also ever present is the big dino damage wound on the flank which can't be covered up. At least it's partially camouflaged by the new paint job in this case. Which brings us to this figure's only new feature: the elaborate colour scheme. If you ever wondered what a possible Camo-Xtreme Lava Dilophosaurus might have looked like, this could very well have been it. It gives this dinosaur a very dragon like feel, its already bizarre look being fused with colours which spawn a sense of fire and danger. The details are also nicely done, especially on the head, like the crests and the eyes. However, the frill should have gotten more attention, being so obviously there but hardly presented with a paint job to speak off, like the figure was factory painted separately from the frill and its paint job was largely forgotten (which may have actually been the case). Overall, a good paint job, but a bad figure. At least its movie accurate sounds are still there (making the figure hard to play rough with if you want those to stay in working order). Repaint: yes. This is a repaint of the JP III Dilophosaurus figure (Wave 1). It is a first time repaint (yes, those still exist in this day and age!) and, so far, a last time repaint too. Overall rating: 5/10. Despite its effective and original new paint job, this is still not a very good figure due to its asinine posture, gaping dino damage wound and limited attack feature. This dinosaur figure is not rare and can still be found effortlessly. Since this set was a Toys'R'Us exclusive that could change some day, but probably not for the next few years.